The Calvary Love of Jesus Ministries is the vision, God has given to Brother Joe and Sister Jessie. This organization is a non-profitable Ministerial Organization. The Lord is using it to spread HIS message of Love, Compassion & Healing leading to the Salvation of the souls. The fruit is joy to the life which is touched. Millions are being saved by the Lord worldwide through this HIS humble instruments. We pray this Ministry over the internet would be a blessing for you too. To tell the world the GOOD NEWS that the Lord Jesus Christ is the Savior of the whole world and that In His name there is REDEMPTION from eternal damnation for all men. Praise The Lord! To bring healing to the body, mind and soul through the ‘Healing Ministry’. To help the poor and needy through “The Good Samaritan” an arm of the Calvary Love of Jesus Ministries. With prayer and great burden, the Lord’s work is being accomplished by His grace. Founded upon the word of God ‘The BIBLE’, this ministry is a sincere effort to reflect and echo the heart of our Lord & Saviour Jesus Christ. There is so much to tell you from the heart of our Savior…there is so much to learn from HIS bleeding heart…This site is ” The Heart cry of the Saviour “. It is a full blooded instrument in HIS nail pierced hands. ” The Calvary Love of Jesus Ministries ” is The Heart Cry of the Master unto the perishing souls. 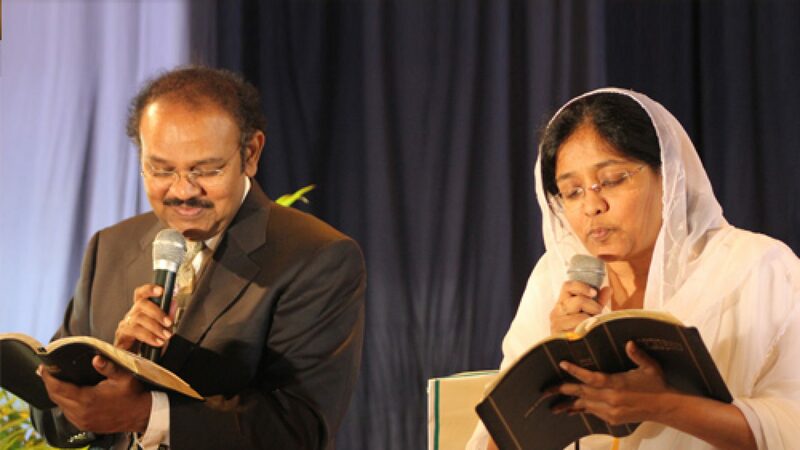 GOD has placed HIS burden upon Bro.Dr.Joe Madhu Payarda & his sister Sis.Dr.Jessie Veena Payarda. HE is mightily using this brother and sister team of young evangelists to proclaim His message of Calvary Love of Jesus Ministries and for the turning of countless many souls unto the Cross for to be saved by HIS precious blood. The Lord is manifesting HIS grace through signs and wonders. Ever since their early teens, the Lord Jesus Christ is using them for more than 3 decades. The Lord is leading them both to many tribal areas, villages, towns, cities and countries to proclaim HIS Gospel of Love and Compassion and Salvation. The messages of Brother and Sister contain the Heart Cry of the Savior. Every message is Spirit filled manifesting the power of the Lord God. Countless number of lives are being saved healed and delivered and miracles taking place for His glory…. Amen! The above verse puts in a nutshell, the calling of the Lord in the life of Brother and Sister. God revealed to their parents: Long before brother and sister were born, the Lord had planned to use them in HIS grace. Their father Mr. Prabhakar had received a prophecy when he was 10 years old from a servant of GOD named Sadhu John. The Lord had said that HE will be using his children a son and a daughter for HIS ministry all around the world mightily for His glory. Likewise, the Lord gave a similar word to their mother Mrs. Mercy Prabhakar too. God’s vision and calling to Bro. Joe & Sis. Jessie: The Lord Jesus Christ gave HIS first vision to Bro. Joe when he was a child of 3 and a half years old. HE then gave a similar vision to Sis. Jessie when she was also around 3 and a half years old. Then their parents remembered the Lord’s prophecy and committed their children to HIS hands. The Lord’s vision of introduction to these young lives has always been the core of their thrust for the Lord. The Lord’s love compels them to serve HIM. The Lord anointed them with the various gifts of HIS Holy Spirit. While continuing with their higher education they grew in the Lord and served Him.